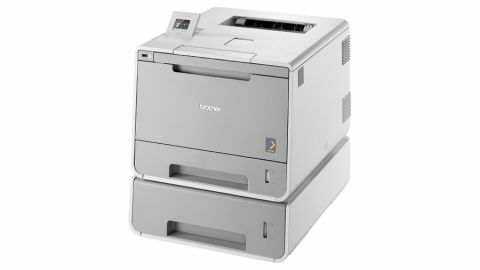 The HL-L92000CDWT is a very capable printer that doesn't cost a fortune. Brother's offering should be on your shortlist if you're looking for an economical and capable colour laser for everyday printing. Printing is supposed to be a simple matter, but the more devices you have to support the more issues you need to consider. Desktops may be perfectly happy with USB or Ethernet connections, but mobile workers expect Wi-Fi in its various flavours – and if you're part of the modern multi-device world, enabling printing from smartphones, Chromebooks and tablets involves yet more standards to support, such as AirPrint and Google Cloud Print. Can you get all of that for an SRP of £659 inc VAT (US$700, or around AUD$745)? Brother says you can. The HL-L9200CDWT promises high speed, high quality colour and mono laser printing that won't break the bank or frustrate end users. Brother claims both best in class print speeds (up to 30ppm) and the firm's best ever total cost of ownership thanks to what it calls "super high yield toners" delivering up to 6,000 pages at the standard 5% coverage. You can't fault the HL-L9200CDWT's credentials. It has wired (10/100 Ethernet) and wireless (802.11b/g/n) networking, USB and Wi-Fi Direct, and it supports both Apple's AirPrint and Google's Cloud Print for mobile devices. It's Windows, Mac and Linux compatible, emulates PCL6, BR-Script 3 (Brother's version of PostScript 3), PDF 1.7 and XPS, and promises up to 30ppm print speeds in both mono and colour. It offers automatic double-sided and A5 booklet printing, and it's designed for a maximum of 5,000 pages per month. It's a hefty thing: 410 x 495 x 445mm of inoffensive light grey plastic with a back-threatening weight of 28.3kg if you include the optional (but included) 500-sheet lower paper tray. Total paper capacity is 800 sheets, split between three paper feeds: the lower tray, a 250-sheet main tray and a 50-sheet multipurpose tray. The multi-purpose tray folds away when not needed, which is useful as it feels a little flimsy – it's not something you'd want to leave extended for fear of someone bumping into it and breaking it. Ports and buttons are kept to a minimum. There are Ethernet, USB and power ports on the back and a USB port for printing images from flash drives on the front, and the power button and hidden controls are just in front of a 4.5-inch pop-up colour touchscreen. When the printer is on the controls are backlit through the casing, which is a nice effect, and you navigate the menus and submenus by using the backlit controls and then tapping the screen to make a selection. Connecting to Wi-Fi, which is often a trying task on wireless printers, is simple enough: the menus provide options for push-button and PIN code WPS and Wi-Fi Direct as well as the usual SSID and network key options. We had the HL-L9200CDWT printing happily on our wireless network in a matter of seconds. The supplied software depends on your operating system. The installation and documentation disc simply takes Mac users to the Brother website, which at the time of writing doesn't turn up any results for this particular printer (we're clearly better at finding things than Brother is; the appropriate page is here). Linux users don't get anything at all (again, they are expected to use the website), and the Windows documentation for network users doesn't work in Internet Explorer on Windows 8.1. The printer will work with Macs, which automatically recognise it and install the necessary drivers, but you don't get access to Brother's supplied BRAdmin Professional 3 management software, which is Windows-only. Setting user passwords, page limits and restricting or giving specific users access to particular printing functions on non-Windows devices is still possible, but you need to do it through the web-based administration interface. Printing is fast: a page of text sent wirelessly took 12 seconds to appear, while full page, full colour photographs sent via AirPrint averaged just short of two minutes (115 seconds) each. A more typical business document, a six-page report mixing black text with coloured charts, headlines, illustrations and tables, again sent via AirPlay, was completed in 32 seconds. Text is crisp and clear, and photo quality was surprisingly good for a laser. The 2,400 x 600 dpi prints were akin to photo quality inkjet printing on standard paper and appeared without significant banding or colour issues, but we did find the images to be slightly darker than the originals. The quality's decent, it's simple enough to set up and the sticker price isn't too frightening. What about the running costs? At the time of writing a black toner with a 6,000 page yield is £54 (around US$90, AUD$100), with 6K-page cyan, magenta and yellow cartridges £117 (around US$200, AUD$210) apiece. The drum unit has a claimed life of 25,000 pages and costs £112.80 (around US$195, AUD$205) to replace, while the belt and waste toner have lifespans of 50,000 pages and cost £69.60 (around US$120, AUD$130) and £13.20 (around US$22, AUD$24) respectively. All prices exclude VAT. Brother predicts energy consumption of 21kWh per week in average use.